The Bandra Worli Sea Link aka Rajiv Gandhi Seal Link is situated in the Mumbai is a magnificent landmark of the country. It is India’s first eight-lane, cable-stayed freeway over the open sea bridge which is used to connect Bandra and Worli . From the viewpoints at Bandra Fort and Worli Fort, with the Arabian Sea and sky in its backdrop, you can get the best view of the Bandra-Worli Sea link. While driving through, you can have the view of Mumbai skyline on one side and the Arabian Sea horizon on the other. The construction work of this bridge was in the year 2000 and was open to public in the year 2009. This bridge not only helps you to pass the sea smoothly, but in the recent year the several modification are made to make it a top tourist attraction for all Mumbai visitor . Special impression is given on bridge lighting which makes it a must watch place in the night. In the night the whole bridge is illuminated with beautiful light which gives it a heaven like look. It not only help You can't stop your self to say "Wow" . Lighting solution does not disrupt the surrounding high rises, it can be controlled remotely, and can be customized for light shows. Philips Color Kinetics LED lights are used to brighten the bridge. The main purpose to select the Philips Color Kinetics LED is that it consumes less power and have millions of hours of life line. As compared to others it gives more bright lights too. 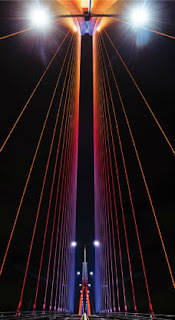 From Architecture to decoration, lighting, everything of this bridge is of International standard. We can compare this bridge with world's most unique bridges. 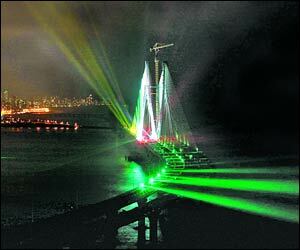 So next times if you plan to visit the Mumbai don't forget to visit this Bandra Worli Sea Link. Do Gujrat need an icon?